Are you in search of the perfect pillow? Manufacturers make a lot of claims about their pillows, that they can keep you cool, cure your back pain, stop your allergies and give you an all around better night’s sleep. Unfortunately, there is no one perfect pillow that works for everyone. The type and amount of fill varies greatly from brand to brand, and what may work perfectly for your spouse’s back pain may be a major trigger to your own seasonal allergies. Read on for a description of each of the most popular fill types on the market, along with the pros and cons of each. Down is the bottom, fluffy part of a bird’s feathers, and Hungarian goose down is considered to be the highest quality of down used in pillows. Look for pillows that specifically state they are 100% goose down – otherwise a proportion of the filling may be feathers instead, whose quills can poke through the pillow and prick you while you sleep. While you may spend a bit more for these luxurious pillows, down lasts up to 3 times longer than synthetic alternatives. Are there “down” sides to down? Down pillows tend to absorb more body heat, making them feel warmer in summer months, and some people are uncomfortable with the use of animal products. You may think feather pillows would be similar to down, but that is not the case. They might start out feeling relatively the same, but feather quills tend to naturally align over time, causing them to lay flat and rob the pillow of its fluff. You’ll find the same issues as with down when it comes to negatives – feather pillows also retain body heat, and are considered inhumane to some. If you are a fan of the down and feather feel, spend the extra money and go for down. Wool pillows are stuffed with the fine fibers from the fleece of sheep, goats, and occasionally other animals like alpacas. You might be surprised to learn that wool pillows are not necessarily bad for warm sleepers – wool acts as a natural insulator, keeping you warm in the winter and cooler in the summer. Wool pillows are also good at wicking away moisture, and are a great choice for people looking for a chemical-free way to keep cool at night. They do tend to be a bit dense and flat though, so it may take some work to get comfortable. Buckwheat hulls are firm, yet flexible, and are highly breathable so they do not absorb body heat as much as other fillings. These pillows are long lasting and eco-friendly, and are growing in popularity. Not everyone is a fan though – buckwheat pillows tend to be quite heavy, and make a rustling sound when moved. This can be disruptive for some lighter sleepers. Microbeads are a synthetic alternative to buckwheat, and share many of the same characteristics such as malleability and breathability. Microbead filling has become popular recently with new pillow brands claiming they keep you cool while you sleep. They are not as long lasting though, and the beads tend to have a mild chemical odor. Polyester fiberfill pillows are very popular, mainly due to their low price and because they are made without animal products. However, they are not breathable and do not last very long – frequent use leads to clumping making the pillows uncomfortable soon after purchase. 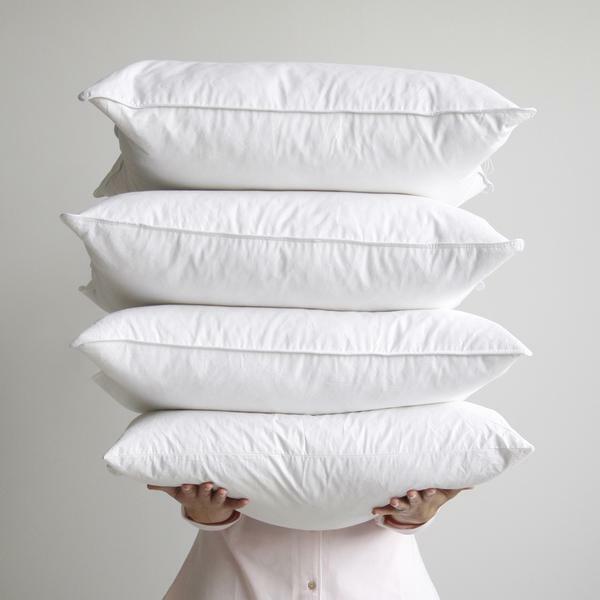 These pillows are best suited for filling decorative shams that will not be used for sleeping. Natural latex is the chemical-free version of a foam pillow. It is made from the milk of the rubber tree. Many chiropractors recommend latex pillows for those who suffer from neck or back pain, due to its buoyancy. It tends to push back slightly against your head, leading to a feeling that your head is suspended or floating. Latex is also good at dispersing heat, leaving you feeling cooler as you sleep. These pillows may have a slight rubbery smell at first, so you’ll need to air them out after purchasing, and they are not an option for people with a latex allergy. Long a favorite for mattresses, memory foam pillows are also a popular choice due to their ability to evenly distribute weight and maintain shape. Memory foam is hypoallergenic and antimicrobial, so it’s a great option for people with feather and latex allergies. However it is not a good choice for sweaty sleepers – it absorbs heat and does not disperse it evenly. And, the foam tends to change shape in different temperatures, meaning it will not be the same shape in the summer as in the winter.